It was wonderful to catch up with Rena Psibindi once again. I last spoke to her a few years ago at one of the early Psy-Sisters events she was helping to organise. Now Psy-Sisters has expanded and she has also evolved her singing to where she has now formed a band. On Valentine’s day this year she released the first single with the project, Find Me and last month I saw here Psy-Sisters Emerging Artists event at Paper Dress Vintage in Hackney with other wonderful singers Irene Skylakaki and Elta. I spoke to Rena on the phone and we caught up with where she’s at with the project, and also how she is still enjoying her psy trance DJing and producing and what’s coming up with that. She played at Boomtown again this year and I shared a brief part of her set there a couple of years ago, including songs she co produced with long time collaborator Aphid Moon. 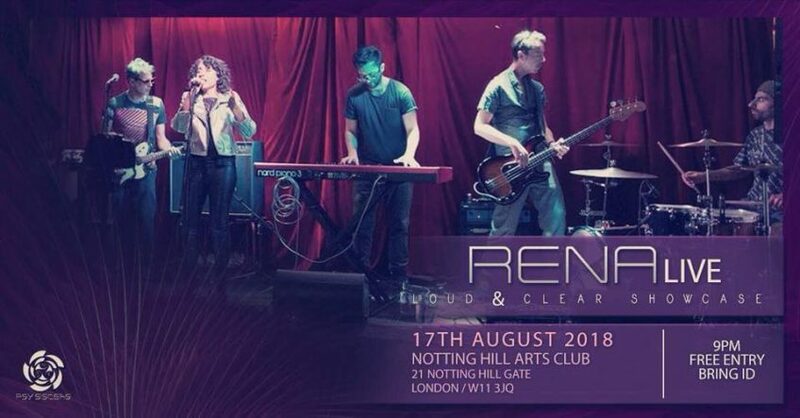 We also talked about the difference with playing live with the band and she has a gig coming up shortly at the Notting Hill Arts Club on the 17th August.